As of July 2, you will see our membership structure and rates adjust to reflect the value of our current services and to allow growth in our future services. Our new rates will allow us to provide all of you, and future members, high-quality programs, allow YOU the ability to customize your membership, and to remain a sustainable facility so that we can continue to operate for the next 20+ years. Our members spoke, and we listened. You now have the option to pick and choose how you want to use the Center by our menu structure. We want you to have the freedom to build your own membership. 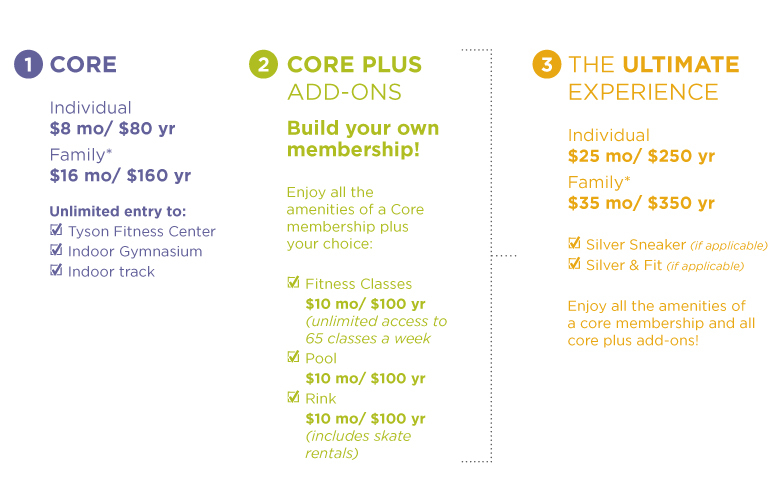 Our Core membership, previously known as Fitness, will remain $8 a month. This still gives you access to our state-of-the-art fitness center, gymnasium, and indoor track, but now for only $10 extra a month you can customize your membership to best fit your needs by adding access to the fitness classes, rink, and/or pool. You might be wondering why the fitness classes are now separate from the Core membership. We’ve greatly expanded our class offerings and have brought on top-notch instructors. This brings a significant cost to our budget. This allows us to offer premier fitness offerings like barre, hot yoga, small-group fitness, and more. Our best value is the Ultimate experience, previously known as All- Access. This still allows you access to all the amenities in the Core membership as well as all the add-ons! The big question you’re probably asking yourself is when will this go into effect for me? If you are currently paying monthly, your current rate will automatically switch over to the new pricing on July 15th. For those who paid in full for the year, your new rate will not change until you renew after the one year from your start date. However, we want to introduce all current members to our new fitness classes, so our Core members will continue to have access to the fitness classes until the one year from their start date. At that point you can decide if you want to add the fitness class package to your membership. We do appreciate our members especially for understanding how important this price increase is for our facility and for your overall experience. We have amplified our list of benefits of being a member including no more long-term agreements! You can now cancel at any time and are always welcome back! Thank you for your loyalty to the Jones Center. Because of our community and the families we serve, we are able to continue to be a place for everyone to learn, play, and belong which is what Bernice Jones wanted.